Six young warriors – sent to do the work of thousands! Generations ago, the orc-hordes swarmed east into the peaceful kingdom of Caithness. Now they're coming back. Last time, it took an army to stop them. This time, your lord is sending you . 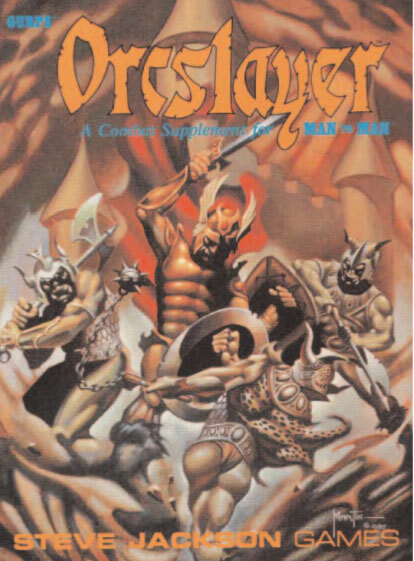 . .
Orcslayer is the first combat adventure for Man to Man. It's both a combat game and a roleplaying adventure. 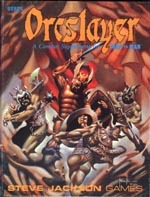 Nine linked combat scenarios are divided by roleplaying "interludes" – a whole new concept in adventure supplements. Orcslayer also includes the NPC Reaction Table from GURPS; random encounters; four new maps (double-sized Castle Keep, Castle Wall that can be duplicated to completely surround the Keep, and Cavern); and 15 pre-generated NPCs of several different races. The book is suitable for three-hole punching. Orcslayer is set in the fantasy kingdom of Caithness – which can become part of any GM's game-world. Further adventures will use the same background, allowing the adventure to continue. But first, you must survive Orcslayer! GURPS Man to Man – Choose your weapons . . . and your armor, and your shield. You're ready to fight it out – Man to Man.